This month (August) signals the 70th anniversary of Indian independence and, traumatically, of the country’s partition which led to the deaths of more than a million people amidst massive population upheavals. To mark the occasion, writer-director Gurinder Chadha has devised a popular historical movie that sketches the drama that beset the nation in 1947. If the movie is more Downton Abbey than an austere account of the complex series of events – and their causes – that attended the event, it will certainly serve as an accessible starting-off point for those interested in pursuing further research. 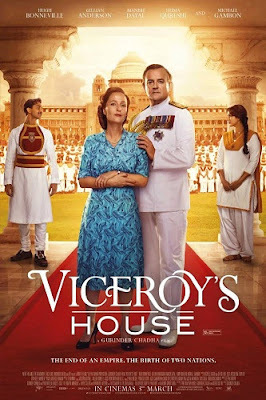 This handsomely mounted period drama is largely set in the English viceroy’s lavish Delhi palace – now the home of the Indian president – where Lord Louis Mountbatten and his wife Edwina lived while negotiating the transference of power from imperial Britain to India. The Downton Abbey atmosphere which largely obtains is not just a function of the “upstairs-downstairs” element which features scenes between Mountbatten and the likes of Indian leaders like Gandhi, Nehru and Jinnah at one end of the spectrum and the lives of the palace servants at the other. The role of Mountbatten is amiably played by Hugh Bonneville, Lord Grantham in the series, who virtually replays his TV character. His wife, sharply interpreted by Gillian Anderson with a cut-glass accent, is, however, a very different beast from Lady Grantham. Edwina is a passionate idealist not averse to sacking her racist underlings who resent or drag their heels on independence. While all the politicking is going on, our emotional attention is drawn to the central relationship between two of the Indian employees at the palace, Jeet (Manish Dayal) and Aalia (Huma Qureshi). This handsome couple are divided by religion and their problems rather simplistically reflect the troubles that beset the nation as street battles begin to erupt between Hindus and Muslims and those contesting the fateful decision to crudely cleave the country into three bits (initially India and west and east Pakistan). There has been considerable controversy over the movie’s historical analysis of partition – with Churchill accounted the ultimate villain of the piece – but it’s hard to dispute the film’s wider suggestion that Britain’s divide-and-rule policies while it controlled India helped to encourage the religious tensions that led to the deaths of so many.